For years we have watched professional skiers Johnny Collinson, Nick McNutt, Julian Carr, Sage Cattabriga-Alosa, Colter Hinchliffe, Marcus Caston, Cody Townsend, and Todd Ligare push the limits of time, space, and powder. What these skiers do is not easy. They do not achieve that level of athleticism, and the eternal glory it brings, by chance. It takes talent and drive to become a professional skier—but more than anything, it takes great hair. 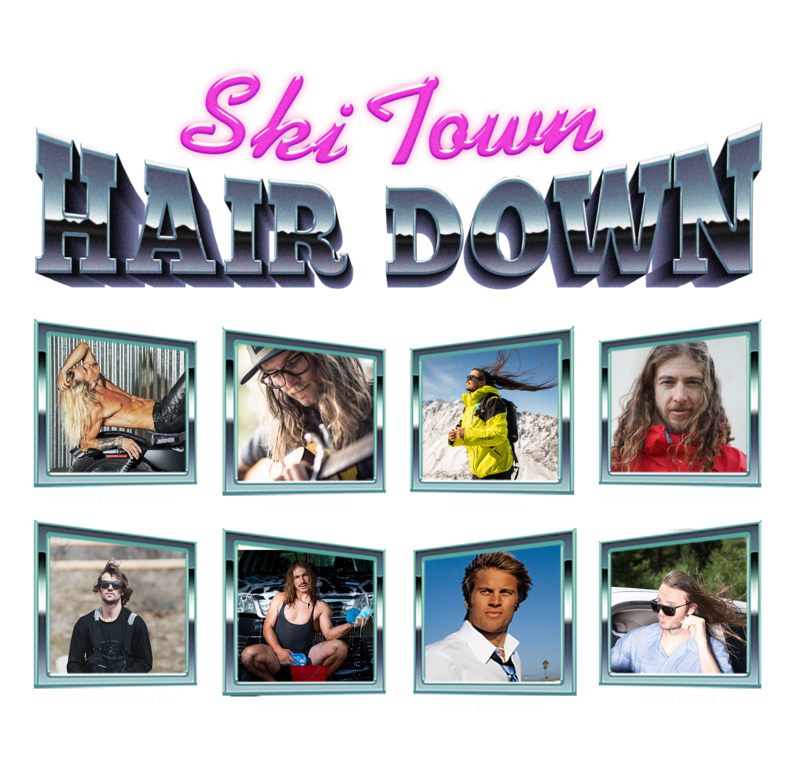 The logical evolution of the event formerly known as the Ski Town Throwdown, the first annual Ski Town Hair Down will give the above-mentioned eight hairy hopefuls the chance to prove themselves in the most important competition in skiing. Who will become the first ever Hair Down champion? You decide. Final results: Marcus Caston wins. Who I hope to beat: I've never even heard of the other guys. Upcoming projects: Warren Miller's “Here, There, and Everywhere,” and I’ll be releasing two personal projects this fall from Snowbird and Iceland. Hair care routine: Why don't you ask me about my pre-ski routine? I'm an athlete, damn it. Granted, a beautiful one, but still a damn athlete! You wouldn't ask Angel Collinson about her hair routine. How my hair helps me ski: The ancient Chinese believed that long hair gave you a better feeling for the snow. And I do have pretty good feeling on the snow. Hair last washed: Currently wet. Favorite hair product: I'm an athlete, dammit! Favorite hair product: You think I’d let that secret out? Never. Who I hope to beat: Johnny. Hair care routine: Brush/wash twice monthly, annual trim. How my hair helps me ski: Like a cat's whiskers, my hair gives me a sense of awareness not fathomable by short-haired humans. Hair last washed: Too long ago. Favorite hair product: Fresh air. Who I hope to beat: William Zabka. Hair care routine: Natural wind care. How my hair helps me ski: : Like whiskers, it's an extension of my nervous system… samurai vibes. Hair last washed: What’s that? Favorite hair product: Botanical blends. Hair last washed: Can’t remember. Who I hope to beat: I know my hair and I know my hair deserves to be on top, and in a few other places. Upcoming projects: POWDER's film on skiing our national parks, "Monumental" and TGR's "Tight, Loose." Last winter my hair and I spent a lot of time skiing and exploring in the La Sal mountains just above Moab for a film project. Hair care routine: I cut it before ski season and not again until after ski season, as a rule. How my hair helps me ski: My hair is with me the whole ski season and that's more than I can say about alot of people and things and even certain body parts (toe nails, teeth, blood, sweat, and tears). Hair last washed: Rinsed it off after surfing in Cali. Favorite hair product: My hat. Who I hope to beat: Angel Collinson’s sister. Upcoming projects: MSP's "Ruin and Rose" and "It's Called Backcountry Skiing. Part Two"
Hair care routine: (See video). How my hair helps me ski: It helps keep my head warm and my receding hairline reminds me how old I am. Hair last washed: Does surfing count? Favorite hair product: A beanie. Who I hope to beat: Colter. Yeah, he looks like a bum, but he gets way too many hair cuts. Upcoming projects: Ring the Alarm, Armada AR family, Armada Snowcities, and TGR "Tight, Loose"
Hair care routine: If I swim in the ocean, washing can be put off indefinitely. Pirate hair is the goal. How my hair helps me ski: The primary thing is it keeps me being generally un-employable. This is key. It allows for skiing every day. Hair last washed: Swam in a lake yesterday. Favorite hair product: That coconut stuff in my girlfriend's shower.